How does the time tracking feature work? LSP.expert allows you to track the time you spend on each job, to invoice the client accordingly or to calculate your performance per hour. In each job, you'll find a Time tracking tab on the left. That's where you can manage your time tracking for this job. To start tracking your time, simply click on the small clock at the right of the job in your list of jobs. To stop tracking your time, click on the clock again in your list of jobs. You can also stop the time tracking by clicking on the red dot in the menu (which appears when you start a tracker). 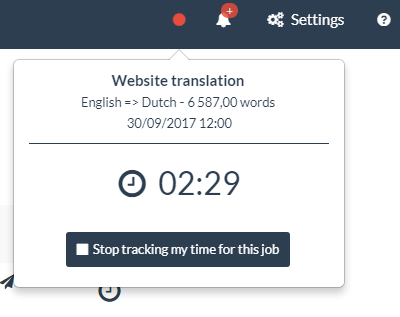 When you click on this red dot, you see for which job your time is being tracked and how much time you've already spent on it. To add a time manually, click on the Time tracking tab in the job, and then on Add a time. To enter hours and minutes, you can choose: '30 minutes' can be written '0.5', '0:30' or ':30'. You can then edit or delete your entries using the corresponding buttons on the right. To include some of your time tracking entries in your invoice, you have to select the 'Time-based invoicing' option in the job details. If you didn't select this option and you click on the little red cross to define an entry as 'Billable' in the Time tracking tab, the system will ask you if you want to select the 'Time-based invoicing' option for the job. Your time tracking entries will also be used to calculate your performance in the Performance report. If you're using LSP.expert as a team (Team subscription), note that several users can track their time simultaneously. Each user indeed has a separate time tracker but can see the others' trackers (and stop the tracker of a colleague if he/she forgot to stop it before leaving, for example). If several users worked on the same job, please note that their time for this job won't be taken into account in the Performance report.